Fast growing scrambler, usually trained as a climber. Strong stems and evergreen or semi-evergreen ovate leaves. 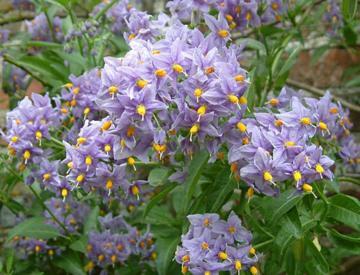 Clusters of fragrant, deep purple-blue flowers from summer to autumn. Sometimes followed by yellowish-white fruits. Best in well drained neutral to alkaline soil in a sheltered sunny site.